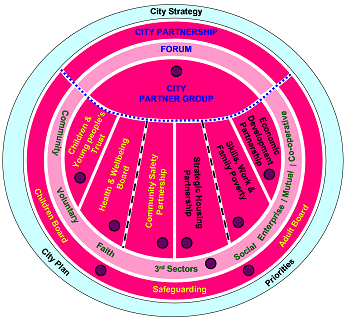 There are a large number of strategic partnerships in Salford, with the majority coordinated by Salford City Council and falling under the auspices of the Salford City Partnership ‘family’. Salford City Partnership will lead the development and coordination of joint strategies and activities in order to position Salford as a world class city. The Partnership will ensure the best outcomes for the people of Salford by working together, sharing resources and reducing duplication. This will be achieved through steering public services and ensuring the community has voice in strategic decision making. These forums were all rebranded in early 2016 as VOCAL VCSE Forums.